The Women’s Engineering Society (WES) has announced the appointment of Elizabeth Donnelly as its new chief executive officer with effect from 23 August 2018. This follows the announcement that Kirsten Bodley would be leaving WES at the end of August 2018. After an early career in IT, Elizabeth graduated from the Open University, specialising in systems thinking. She worked with Rolls-Royce from 2005-2008 and was awarded Membership of the Royal Aeronautical Society as a result. Elizabeth went on to lead skills policy for ADS Group Ltd, the trade association for aerospace, defence and security. She chaired the RAeS Education and Skills Committee and was a founder member and later Deputy Chair of the Women in Aviation and Aerospace Committee. Elizabeth also founded the RAeS Amy Johnson Named Lecture in 2011 and from 2008-2011 was a Non-Executive Director of the East Midlands Regional Development Agency. In 2013 Elizabeth set up her own consulting company working with charities and universities and graduated with an MSc in Systems Thinking in Practice from the Open University in 2017. During its centenary in 2019, WES will be undertaking a variety of national and local events and activities. These are in recognition of the many women who have made a significant contribution in the past, and to embrace future change where we expect to see more women working in engineering and related careers. The 2019 WES centenary celebrations include: the WES Centenary Trail, the WES Centenary Annual Conference, ‘100 Violets’ – an activity being led by the WES Young Members’ Board, plus locally organised events. In addition to this, our annual campaign ‘International Women in Engineering Day’ (INWED) has the theme ‘30by30’, signifying our aim for 30% of the engineering workforce to be women by 2030. The Women's Engineering Society is a charity and a professional network of women engineers, scientists and technologists offering inspiration, support and professional development. Working in partnership, it supports and inspires women to achieve as engineers, scientists and as leaders; it encourages the education of engineering; and supports companies with gender diversity and inclusion. 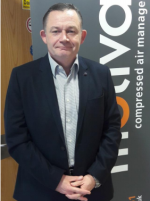 On 1st December 2017, Iain Beadle joined MOTIVAIR as CEO. The company says Iain has an extensive background in building and growing B2B industrial service organisations, including the last 5 years as a managing director at Synectics and he brings experience in the implementation and delivery of large scale technology engineering led projects, emergency service and PPM based contracts and the efficient deployment of rapid response engineering, all of which represent the core product offering at Motivair Compressors.